IPO aspirant enhances its utility-scale concentrating solar power generation technology with crucial storage component. A common refrain about the limitations of solar power is that the technology only works when the sun is shining. That's certainly true of photovoltaic (PV) solar technology. And of course, wind power only works when the wind blows. Some consider these variable energy sources a threat to the reliable operation of the electrical grid. Concentrating solar power (CSP), while it might be more expensive than PV technology, has an absolute advantage over PV -- the ability to store thermal energy long after the sun goes down. This ability improves CSP's capacity factor and dispatchability, and has the potential to improve CSP's levelized cost of energy (LCOE). Now BrightSource Energy, a VC-funded CSP firm with gigawatts of PPAs in its pipeline, has launched a power tower CSP system that includes two-tank molten-salt storage. BrightSource claims to have efficiency and cost advantages over competing parabolic trough solar thermal technologies because of the power tower’s ability to reach higher temperatures and higher pressures during operation. BrightSource’s power tower solar thermal system uses a field of software-controlled mirrors called heliostats to reflect the sun’s energy onto a boiler atop a tower to produce high temperature and high pressure steam. The steam is used to turn a conventional steam turbine to produce electricity. When paired with storage, the steam is directed to a heat exchanger, where molten salts are further heated to a higher temperature, storing the heat energy for future use. Later, when the energy in storage is needed, the heat stored in the molten salts is used to generate steam to run the steam turbine. Today, molten salt storage is used widely in solar thermal plants in Spain. The “solar salts” are composed of 60 percent sodium nitrate (NaNO3) and 40 percent potassium nitrate (KNO3) -- commonly available materials. A 19.9-megawatt Gemasolar CSP power tower plant in Seville, Spain offers 24 hours of uninterrupted operation. The 19.9-megawatt steam turbine can supply electricity to a population of 25,000 households using a 140-meter-tall tower and a field using 2,650 heliostats. That's small by the standards of BrightSource Energy's Ivanpah One installation, with its more than 300 megawatts and 173,000 heliostats. Molten salt storage has been used with trough CSP systems, but Gemasolar is the first plant to use the thermal-storage system in a central "power tower" and heliostat architecture. And now BrightSource is joining that list. This accomplishment would seem to change the real practicality of solar power if the costs are right. Brett Prior, a senior solar analyst at GTM Research, has looked at the LCOE economics of CSP in a recent report, Concentrating Solar Power 2011: Technology, Costs and Markets. Cost per watt -- a key piece of the LCOE calculation -- is very high for the Gemasolar plant, but the expected LCOE for a full-size tower plant with storage could be lower than all other solar options. (See chart below and the report for more details.) But even if solar can get its LCOE down to $0.10/kWh, that still seems high versus gas combined-cycle plants at $0.06/kWh. That is the harrowing number that solar and all new energy must compete with if going after dispatchable wholesale power. 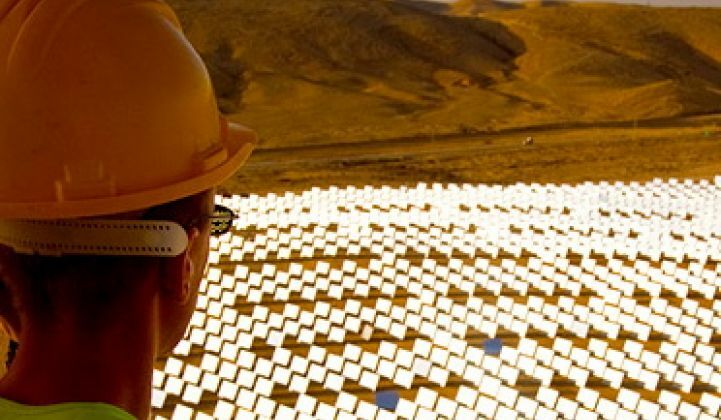 Another entrant in the CSP with molten salt storage field is Santa Monica, Calif.-based SolarReserve, which is building a 110-megawatt solar thermal plant in Nevada with help from a $737 million DOE loan guarantee. SolarReserve CEO Kevin Smith told us back at Intersolar that it could produce power for close to 12.5 cents per kilowatt hour, a figure that will drop to 7.5 cents in a few years. According to the BrightSource S-1, the firm has at least three patent applications covering storage.